You know what it's like - we've all been there! You cook a nice, greasy fry up for your lazy breakfast morning when, just as you are about to tuck in, you realise you should have been somewhere else 5 minutes ago! Do you rush down your fry up and make yourself feel ill? Or is there a realistic way to eat your hearty cooked breakfast on the go? In other words... if only you could get a full breakfast pie!!! 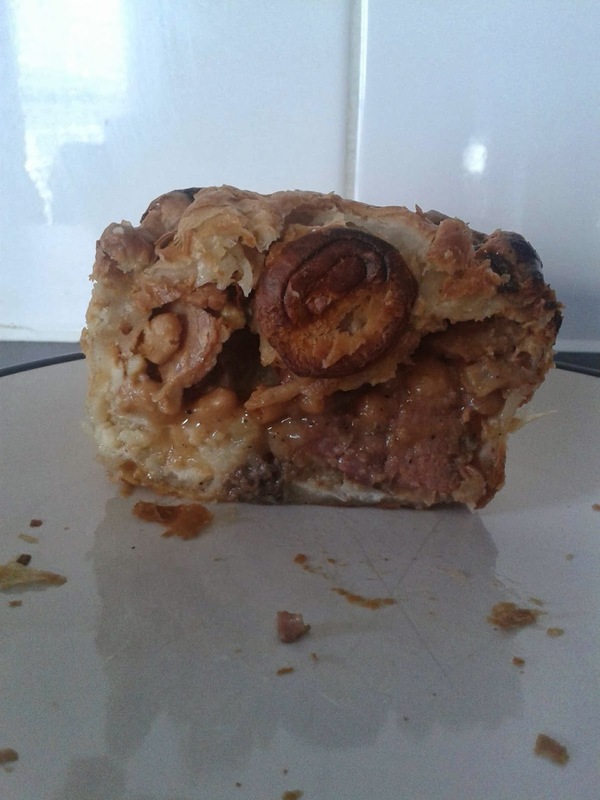 Now we Pierateers have been searching for some proper full breakfast pies for a while now, so you can imagine our delight as we pulled a breakfast pie out of the treasure chest of free pies posted to us by Simple Simon's Perfect Pies to review! At £4.05, you probably wouldn’t be able to afford to eat this pie for breakfast every day (as tempted as I may be to try this!) but this pie compares with the price you’d pay for a cooked breakfast at a local diner or pub, which we think is pretty good considering the quality you’re getting. But enough of whetting our appetite! Sure, it's a brilliant idea, but what did it actually taste like?! Well I hope you can see from the photo cross-section that there are significant chunks of meat bursting out of this pie. You've got pieces of bacon, sausage, egg, potato, cheese, tomato and baked beans. Yes, Simon has simply put a full English breakfast into pastry and made a pie! It really is that simple! And let's face it - it's not rocket science! The pastry was firm enough to hold the packed content in (ensuring they have maximised capacity) but still crumbled nicely under the weight of knife and fork. There was a slight leakage of fluid out of the bottom of the pie which meant the base was a bit soggy. However the sides and lids were spot on - crisp and a beautiful golden colour. The content was quite heavily tinged with the tomato and baked bean flavouring (something I personally would rather was omitted, as I'm not a baked bean fan! ), however it certainly contained all the ideal parts of a great full breakfast, but one you could eat on the go if required! An interesting mix of flavours with every mouthful – which may not be everyone’s cup of tea – but one I certainly would eat with pleasure again! Thanks Simon! 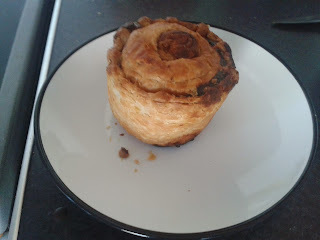 If you want to read about some other breakfast pies, have a look at this delight from Morrison's or this item from Jumbucks. p.s. You've got to love the Simple Simon's Nursery Rhymes section on their website!